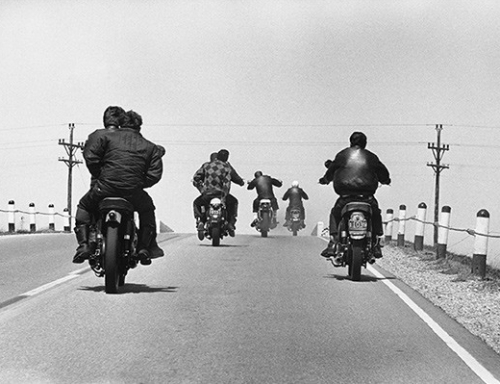 Danny Lyon doesn't want to talk about the Chicago Outlaws Motorcycle Club. The legendary documentary photographer won't say much about riding alongside Cal, Funny Sonny, Johnny, and the rest of the leather-clad gang in the 1960s, on an old Triumph cobbled together in a Hyde Park garage out of parts kept in coffee cans. He won't go into great detail about the photos he took with his trusty Nikon: Benny, leaning back in the saddle, a silhouette lit up from streetlights and neon signs at Grand and Division; Big Barbara, with eyes you could get lost in, staring into a jukebox; or Andy, drinking Hamm's longnecks off a pool table at the Stoplight bar in Cicero. For the full article, please visit The Chicago Reader.